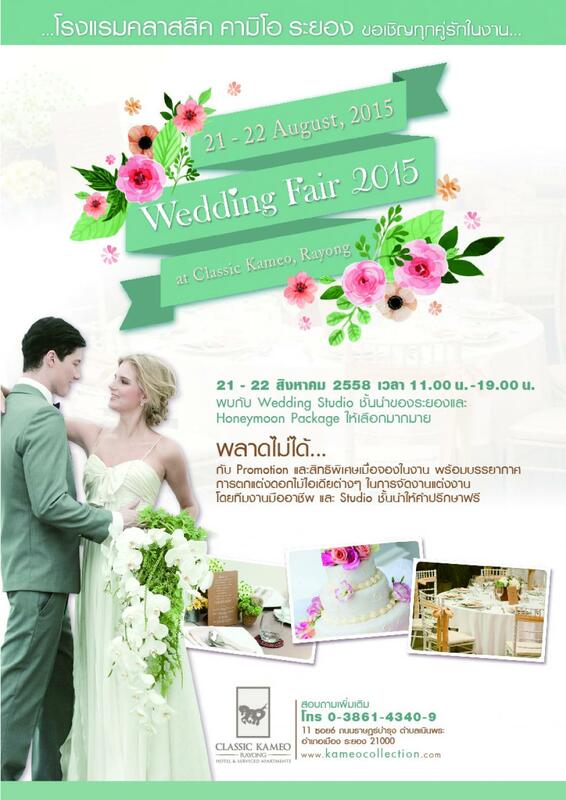 On 21 -22 August from 11 a.m. to 7 p.m. within the Koh Kaew 1-3 meeting rooms, the Classic Kameo Hotel, Rayong will host The Wedding Fair 2015, an event where couples can collaborate with leading wedding planning studios and conceptualize their ideal wedding ceremony. Attendees will have the opportunity to take advantage of a variety of promotions and packages that will help them adhere to their financial plan and actualize their vision down to the last detail. Special honeymoon packages will also be available; to give couples the option to plan every aspect of the beginning of their life together with ease. With every package purchase, attendees are entered into a lucky draw and become eligible to win gift vouchers for accommodation at participating Cape and Kantary Hotels. The fair will also feature a fashion show - presenting the latest trends in wedding haute couture - to provide further inspiration to brides and grooms to-be. วันที่ 30 กรกฎาคม 2558 เวลา 16:48 น.